Dallas Dogger, from SiteLink International, was equally surprised. “I am very honoured to represent SiteLink in the Southern Hemisphere and this award this year confirms the commitment to our customers.” he said. 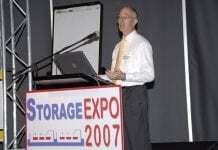 Record growth over past year reflects the storage industry’s acknowledgment of SiteLink services.